The Saudi-led coalition striking Houthi rebels in Yemen is losing roughly one to two tankers worth of U.S. fuel per day after the Air Force halted its mission of refueling the coalition several weeks ago, officials with U.S. Central Command said. But even before the announcement to halt refueling was made Nov. 10, CENTCOM had begun working with Air Forces Central Command and Transportation Command "to reduce its dynamic requirement for tankers" in the Horn of Africa region, according to Army Maj. Josh Jacques, a CENTCOM spokesman. 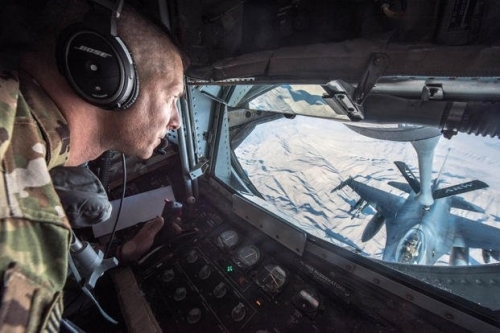 "AFCENT constantly assesses its dynamic requirement for air-refueling capacity and works with CENTCOM and TRANSCOM to manage tanker resources to meet this dynamic requirement," Jacques said. Defense Secretary Jim Mattis revealed in recent weeks that the U.S. has refueled "less than 20 percent" of the coalition's jets since the conflict began in 2015. "We refuel probably less than 20 -- I think less than 20 percent of their aircraft," he said during a speech at the United States Institute for Peace. "They have their own refuelers, by the way." Jacques said that means, on average, one to two Air Force tankers won't be used on a daily basis to refuel coalition planes in the Horn of Africa region. "While we cannot speak on behalf of the Saudi-led coalition regarding their aircraft, in general the U.S. provided 1 to 2 tankers' worth of fuel per day, based on the average offload of fuel," he said. "That said, rates of U.S. refueling vary based on the needs of operational planning and execution." An Air Force KC-135 Stratotanker can carry a refueling load of up to 200,000 pounds of fuel. Earlier this month, the Saudi government said it had "requested cessation of in-flight refueling" from the U.S. for its fighter jets after The Washington Post reported the Trump administration was planning to stop the refueling over growing political concerns. Lawmakers for the last three years have tried a variety of ways to oppose the war. That includes invoking the War Powers Resolution of 1973, which would force the U.S. to end its involvement in the Saudi-led conflict within 30 days of passage unless voted upon otherwise, amid the growing number of civilian casualties and what many officials around the world have declared a humanitarian crisis. The Trump administration has also faced pushback for its continued support of Saudi Arabia in arms sales and intelligence after the death of journalist Jamal Khashoggi, a Washington Post columnist. Khashoggi is believed to have been killed by Saudi operatives at the Saudi Consulate in Istanbul in October. Following the Post's report and the Saudi government's announcement, Mattis said the Defense Department welcomed the decision. "We support the decision by the Kingdom of Saudi Arabia, after consultations with the U.S. Government, to use the coalition's own military capabilities to conduct inflight refueling in support of its operations in Yemen," he said. However, Mattis' statement didn't clarify how the U.S. would monitor Saudi jets refueling from U.S. tankers for operations against the Islamic State -- it is a global coalition member in the U.S.-led fight -- and instead return and use that fuel for strikes in Yemen. Jacques said that isn't a concern for U.S. officials. "Air-to-air refueling locations in support of the counter-ISIS coalition are in a different vicinity than those used to support the Saudi-led coalition's operations in Yemen," he said. "The significant distance between the two areas makes it operationally infeasible for Saudi fighter aircraft refueling from tankers supporting the [counter-ISIS] mission to transit and conduct operations in Yemen." As of Aug. 31, Air Force tankers such as KC-10 Extenders and KC-135 Stratotankers had conducted 2,919 sorties and offloaded 92.3 million pounds of fuel to coalition fighters in the Horn of Africa since the onset of the Yemen crisis. That amounts to 12,102 refueling operations, or what officials describe as "refueling events," CENTCOM has said. By comparison, in that same timeframe, the Air Force has conducted 47,624 sorties and offloaded more than 2 billion pounds' worth of fuel in operations against the Islamic State in Iraq and Syria, according to the latest Air Forces Central Command airpower summary. More than 275,000 aircraft have been refueled for Operation Inherent Resolve within the last three years, AFCENT said. While operations have slowed in the Iraq and Syria fight within the last year, officials said airmen will nonetheless keep busy for refueling missions in the area of responsibility. "There is no shortage of global requirements requiring tanker support, to include a critical refueling capability mix supporting U.S. Central Command objectives in theater," Air Mobility Command spokesman Col. Chris Karns said. "Aerial refuelers continue to ensure the persistence and ensure the necessary reach to achieve desired effects. For Operation Inherent Resolve alone, the U.S. has fulfilled about 90 percent of the tanker capability requirements" for the coalition, he added. Jacques reiterated there is no intention of slowing down in other Middle East operations. "Refueling operations will continue throughout the area of responsibility to deliver decisive airpower on behalf of U.S. Central Command for the security and stability of the region," he said.